The aunt of a three-year-old girl who died in the Grenfell Tower fire has broken down as she told the blaze inquiry how much she had been looking forward to seeing her niece grow up. Amaya Tuccu-Ahmedin died with her mother Amal Ahmedin, 35, and father Mohamednur Tuccu, 44. 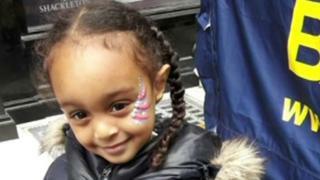 Ms Ahmedin's sister, Winta, said she would "continue planning" Amaya's life. "What she would be doing today, tomorrow, her 10th birthday, her 18th, her 21st and the rest of her life." What can we expect from the inquiry? Amaya and Amal were found next to each other in the lobby of the 23rd floor, while the body of Mr Tuccu was found outside the building. Amna Mahmud Idris, one of Amal's cousins, also died on the night of 14 June last year while visiting the family. Winta recalled sharing a bedroom with her sister when growing up and how Amal used to hold her tightly when she had bad dreams. She told the public inquiry: "That's where they were when they were burned alive, holding each other tight trying to squeeze the nightmare away. "To this day and the rest of my life I will never accept that they are gone and that I will never be able to see them again and I will never be able to feel their warmth, their kind and loving hearts." Another of Amal's sisters, Feruza Afewerki, said she "still hadn't been able to make sense of the senseless deaths of innocent and precious lives". She told the hearing: "Those we grew up with, who shared our fondest memories with, celebrated and mourned, have had their lives stolen from them while the whole of London watched." In a video tribute, Mr Tuccu's brother, Ibrahim Toukou, said his whole family were unable to come to terms with the loss. He recalled their growing up in Eritrea and how his brother fled the country after becoming a freedom fighter, eventually settling in the UK, where he gained two degrees. Ibrahim Toukou had not told his children about the deaths, instead saying their relatives had gone on a trip. He stayed in contact with his brother, who was working as a security guard, from his then home in Saudi Arabia over Facebook, adding: "I used to dream of us being reunited, I dreamed of us being together as brothers with our families and children. "When I heard the news of the fire I was just praying they would be alive so we could have a chance to meet at least once as a family." In a tribute to Eritrea-born Amna Mahmud Idris, her husband, Ibrahim, said she dreamed of completing her education and becoming an artist. He said: "She was all my life... now I have lost the support. She would support me at all times. "She came to live with me in the UK in March 2016. After one year I lost her forever." 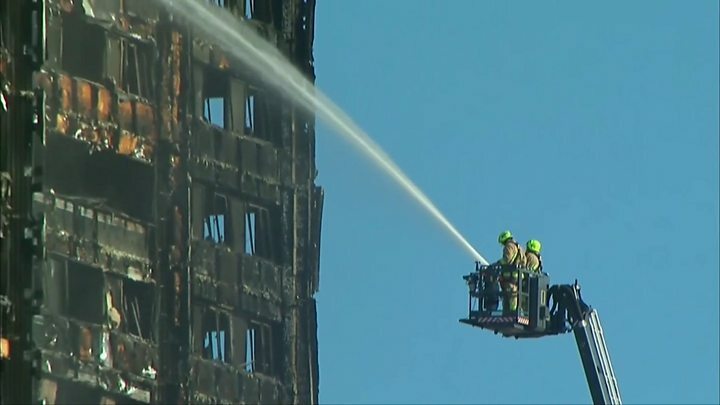 The five members of the Begum family were among the other people remembered on the fourth day of the inquiry into the fire in North Kensington in which 72 people died. Kamru Miah, 79, Rabeya Begum, 64, Mohammed Hamid, 27, Mohammed Hanif, 26 and Husna Begum, 22, were found on the 17th floor, where they lived. The sole remaining immediate family member, Mohammed Hakim, 32, said in his tribute to his parents and siblings: "I can say with my hand on my heart that I am extremely proud of my family remaining close to each other in their last moments before passing away. "I am even more proud as a brother that my siblings did not leave my parents behind, even though they might have had the chance to escape." Mohammed Hakim said his Bangladesh-born parents had mobility issues. His caring father worked as a chef but had had two strokes and a heart attack, and the family complained he should not have been living on the 17th floor "numerous times". He recalled family trips to Holland Park and Battersea Park, his father's love of nature programmes and Arnold Schwarzenegger and James Bond films, and described his mother as "beautiful, loving and generous". He said his younger brothers were his best friends and his sister the family's "perfect little star", an "intellectual" and full of "adventure and spirit". The families of those killed in Grenfell are very much at the heart of these hearings. That was what the chairman Sir Martin Moore-Bick wanted and so far he has been true to his word. Every person who has wanted to speak has been allowed to do so entirely at their own pace. Some who had said they did not want to pay tribute have, having seen how the first three days unfolded, decided they do want to take part, for example the family of Victoria King and Alexandra Atala. Some 10 or so relatives of the Tuccu family were on stage with all invited to speak, four doing so. One family earlier gave Sir Martin a painting of Grenfell Tower which sits on an easel at the front of the room. Today's gift was bread, two Lebanese loaves. One is for the hearing's ushers, the other for Sir Martin himself and, "if they are well behaved" he said, for his team. Fathia Ali Ahmed Elsanosi, 73, who had fled persecution in Sudan, was found on the 23rd floor alongside her children Abufars Ibrahim, 39, and Isra Ibrahim, 33. Her sister, Hayat Elsanosi, listened - sometimes with her head in her hands - as a family friend read a statement to the inquiry, describing Fathia as a "pillar of the Sudanese community in London". She had worked as a teacher at a supplementary school in Kensington & Chelsea for 15 years, helping children from Sudanese families in the UK connect with British culture. "Fathia came to this country as a refugee seeking security and safety after her struggle with the regime in Sudan, where she and her children had been subjected to harassment," her sister said. "She felt safe here in London. Because of the way she died, this now feels like an illusion for us and definitely for her. Our trust in this country has been destroyed." Hayat Elsanosi said she was left partially disabled by a fire herself when aged 13 and so the circumstances of her sister's death was a "double trauma". The day's proceedings opened with a written commemoration for Victoria King, 71, and her daughter, Alexandra Atala, 40, made by Ms King's older sister Penny Pearce. Ms Pearce said that she had lost touch with her sister in the years leading up to the tragedy but a short time beforehand had managed to trace Ms King with help from the Salvation Army. Pictures of the two sisters as young girls were shown on screen at the inquiry as Ms Pearce's statement was read out, saying: "The time we had back in touch meant a great deal. I wish it had been much longer." Speaking of her sister and niece, who died on the 20th floor, Ms Pearce added: "They were and are still together and that is what is most important. "The fire is a tragedy for all of us."